Our tripping program is run out of our outcamping building which holds all the necessary equipment to run successful forays into the outdoors. We pride ourselves on our vast tripping program, boasting as many as nine trips a session consisting of both hiking and canoeing trips. Glide across the scenic waters of Squam Lake, or test yourself against the rapids of the Androscoggin River. There is no better way to travel and experience the wilderness than by canoe. 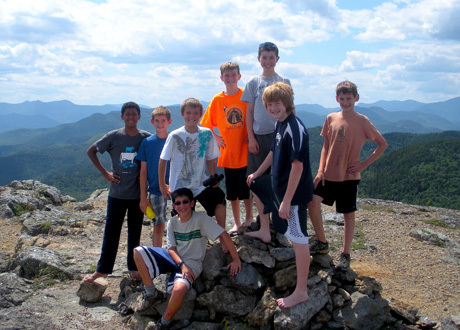 Take a walk up Chocorua for panoramic views of the White Mountains, or battle the elements up the mighty Mt. Washington: no matter what, you are sure to feel elevated! Even the Juniors get into the outdoors! They take a day hike up Mt. Major or Bald Knob and, as a cabin, they embark on a journey across the great Lower Beech Pond to stay the night in the camp’s own lean-to at Perch Point. S’mores included!